Mercury “silver” amalgams are made from a silver alloy powder and liquid mercury. It is a dental material that has long been used and embroiled in controversy. Given that mercury is a highly toxic chemical and odorless, tasteless vapors have been found to arise from amalgams, our office has always and will continue to forgo using any dental materials whatsoever that contains mercury. Furthermore, the old amalgam materials turns an unsightly black color, requires the removal of tooth structure beyond the decay in order to “stay on”, and can expand over time causing fractures and or cracks in the tooth. Our office only uses superior “composites” for fillings and restoratives. They are superior in durability, strength, and above all, they blend in perfectly with your natural teeth colors. 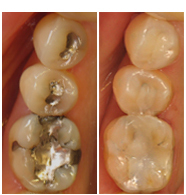 Call us if you would like to replace your unsighly or mercury-amalgam fillings with our composites.